While oftentimes conflicting lore muddles the story of the Magi, those bearing gifts for the Christ child in this icon are Caspar of Tarsus, Melchior of Arabia and Balthasar of Saba. Weary from desert travel, the Magi humbly offer their gifts. Caspar is young, European and offers gold. Gold finances the Holy Family's coming flight to Egypt and also symbolizes Christ's immortality and purity. For his generosity, Caspar receives the gifts of charity and spiritual wealth. Melchior is middle-aged, Persian and offers myrrh. Myrrh is a fragrant gum, which the ancient Israelites believed to strengthen children. This symbol of Christ's mortality was blended with wine and offered to him on the cross, and also mixed with aloes to wrap his body for the tomb. Melchior receives the gifts of humility and truth. Balthasar is elderly, Ethiopian and offers frankincense. Frankincense is a resin used in incense for worship and also symbolizes prayer and sacrifice. Balthasar receives the gift of Faith. And Christ, humbling himself to become man, offers us the greatest gift of all, the light that forever burns in the darkness. "Epiphany" is a word of Greek origin, related to such English words as "theophany," "phenotype," and "phenomenon." It means an appearance, a displaying, a showing forth, amaking clear or public or obvious. On this day, Christians have traditionally celebrated themaking known of Jesus Christ to the world. Several events have been thought of as special instances of the making known of Our Lord,such as: His birth; the coming of the Magi; His Baptism; His first miracle at Cana. Currentmajority usage, at least in the West, celebrates His birth on 25 December, the coming of theMagi on 6 January, and His Baptism on the next Sunday. On the following Sundays up to thebeginning of Lent, we remember Our Lord's public preaching of the kingdom, particularly theearlier stages of that preaching when opposition had not yet crystallized. On the Last Sundayafter Epiphany (the Sunday before Lent), we commemorate the Transfiguration, the climax ofthis first phase of our Lord's public ministry. On Epiphany, then, we commemorate the visit of the Magi, a token of the day when all the peoples ofthe earth will acknowledge Jesus Christ as Lord, God, and Savior. The visit of the Magi isrecorded in the second chapter of Matthew. MAGI, (the Latin plural ofMAGUS), referred originally to the priests of Parsiism, the monotheistic religionpreached in Persia by Zoroaster in about the sixth century BC. In later years it came to meanmagicians, priests, physicians, scribes, scholars, or learned men. From it we derive our word"magic." The KingJames Version of the Bible translates the word as "wise men." Matthew tells us how they came toJerusalem and then to Bethlehem, and gave gifts to the infant Jesus. In poem and picture, the wise men came to be thought of as three kings, and in many countries(particularly Spanish-speaking ones), children receive gifts, not on 25 December, but on 6January in memory of the gifts that the wise men brought to the Holy Child. Christian writershave interpreted the gold as a sign that Jesus is King, the Frankincense as a sign that He is God,and the myrrh (used in embalming) as a sign that He is by His death and Resurrection the Saviorof the world. 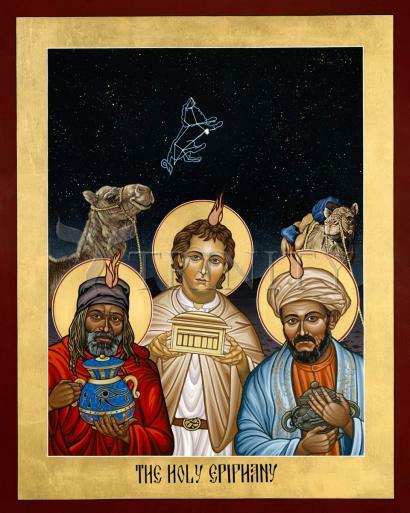 This imagery is found in the song, "We Three Kings of Orient Are."